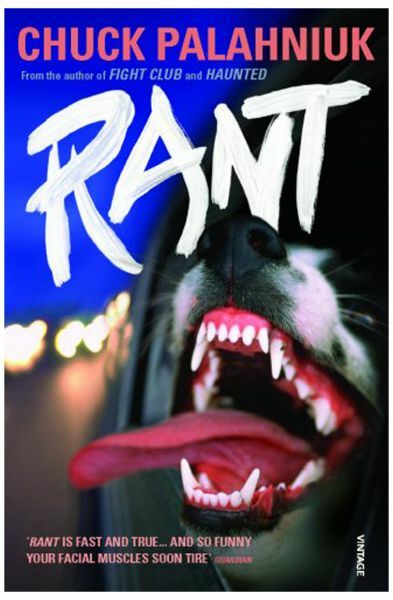 Rant takes the form of an oral history of one Buster Rant Casey, in which an assortment of friends, enemies, admirers, detractors and relations have their say on this (in Chuck Palahniuks words) evil, gender-conflicted Forrest Gump character. Buster Casey was every small kid born into a small town, searching for real thrills in a world of video games and actiodventure movies. Anyone whos ever kissed him would do well to seek treatment, for his recreational drug of choice is rabies and he gets bitten by black widow spiders for the priapic effect of their venom. The high school rebel who wins, Rant Casey escapes from his hometown of Middleton for the big city, where he becomes a leader of an urban demolition derby called Party Crashing where, on designated nights, the participants recognise each other by dressing their cars with tin-can tails and Just Married toothpaste graffiti. (Or with forgotten coffee mugs bolted to their car roofs or Christmas trees tied from bumper to bumper.) During specific windows of time, in limited areas of the city, Party Crashers look for the designated markings in order to stalk and crash into each other. Its in this violent, late-night hunting game that Casey meets three friends. And after his spectacular death, these friends gather the testimony needed to build an oral history of his short life. Their collected anecdotes explore the charges that his saliva infected hundreds and caused a silent, urban plague of rabies. But its a plague that liberates his peers from being stuck in only one boring track through history Expect hilarity, horror and blazing insight into the desperate and surreal contemporary human condition as only Chuck Palahniuk can deliver it. Hes the post-millennial Jonathan Swift, the man to watch to learn whats “ uh-oh “ coming next.